Whether you call them business cards, mommy cards, contact cards, or blogger cards — even in this most digital time in history, almost everyone can use a printed card that contains their contact information. 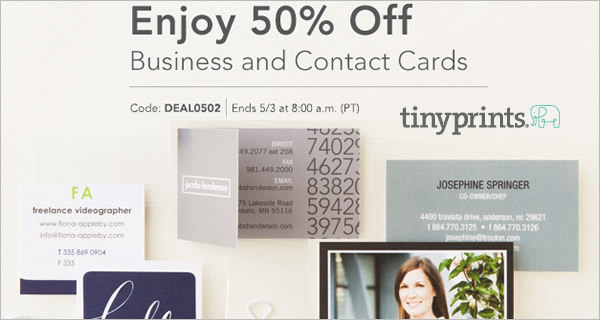 Now through 9:00am PT Friday May 3, Tiny Prints offers all Business Cards for 50% off! Choose a look that reflects your personality and style — there’s so many to choose from. Just visit their Deal of the Day page, choose from hundreds of designs, edit them, get creative with the text and layout, and use promo code DEAL0502 to save 50%. Make sure to complete your order before 9:00am PT Friday May 3. They also have the same deal for business cards and grad contact cards if you know someone interested in those. Choose from hundreds of designs. Edit the font, choose what information to include, and upload a logo and/or photo. This is your time to get creative. Double-check your work. Make sure to proof the card. .
Here’s my recent order from Tiny Prints and I.love.my.cards. The printing is sharp and I love the design. Think business card for moms…and more colorful and fun. Similar to a business card, put your name, contact information and social network links (if you choose), names and ages of your children, and whatever else you want to put on it. If you want to get fun with it, put your children’s nicknames, a fun fact about each of them, design a family cartoon, or put their handprints on them. Have fun with it! The uses are endless. First of all, you can now win some free lunches. Secondly, they are great for babysitters, setting up play dates, and just general use rather than finding a spare piece of paper and a pen. They are also great to include in your children’s backpacks, lunch boxes, and other belongings in case they are lost. What is a Grad Contact Card? You are going to meet a lot of valuable contacts over the next weeks and months. Just because you don’t have a job yet doesn’t mean you don’t need cards. Grad Contact cards from Tiny Prints will present your contact information in a unique and memorable way. With their high-quality cardstock and powerful designs, their cards will have an impact on everyone that comes in contact with them. Whether you are a recent college grad or an unemployed professional looking for a new career, you need an updated card that represents your personal brand. What is a Blogger Business Card? For bloggers, Business Cards are an absolute necessity. With the conference season already ramping up, time is short to get your Business Cards in time for the big summer events! You’ll want to include your name, your blog name and URL. Include your email address, telephone, skype name and all your Social Media handles. Choose a style that fits your blog theme. Consider including your photo! Whether you’re attending a blog conference/event, party or just walking through town, make sure you always keep your contact cards on hand. After all, you never know who you will meet that could change your life.